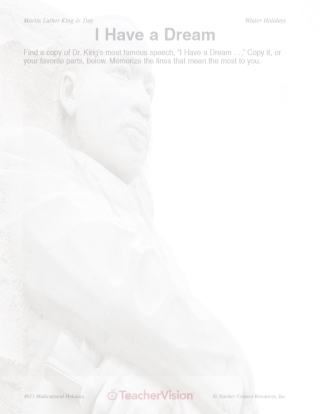 This brief biography of Martin Luther King, Jr. can be used with the Civil Rights Leader lesson plan or on its own to teach students about Dr. King's life and legacy. This is a great reference to use when celebrating Black History Month. History Activities for Grades 5-12. There were two main sources of learning in Martin's young life: books, and his father, who was a Baptist minister. His father knew that in Atlanta, Georgia, where the family lived, Martin, as an African American, would be treated by most of the city's white population as an inferior person. His father wanted to make sure that Martin didn't come to believe that he was inferior. So, he reminded his son again and again, "You are as good as anyone else." As a young man, Martin had some question as to what he wanted to do with his life. Should he be a doctor, or perhaps a lawyer? In either profession he would be in a position to help people. However, he came to realize that he could best serve God and his people by becoming a minister. He studied hard. He gave his first sermon to his father's congregation when he was only seventeen years old. Martin became ordained as a Baptist minister when he was eighteen years old. Martin realized that even though he had been ordained, he needed further education. He enrolled in the Crozer Theological Seminary, Pennsylvania. While there he learned of the work of Mahatma Gandhi. Gandhi had done much to help India's poor people, who were treated badly by upper-class Indians and the British who ruled India. Mahatma's success was due, in part, to non-violent resistance to unjust laws. It occurred to Martin that he could use Gandhi's approach to help African-Americans gain their just (equal) position in American society. After graduating from Crozer, Martin continued his education and earned a Doctor of Theology degree from Boston University. Between his time at Crozer and Boston University, Martin married Coretta Scott, who was studying to become a singer and performer. The newly married couple moved to Montgomery, Alabama, where the now Dr. Martin Luther King became Pastor of the Dexter Avenue Baptist Church. In Montgomery, Dr. King became a respected leader in the struggle to help African Americans achieve the full and equal citizenship to which they were entitled. Among other things, he participated in organizing successful boycotts against public bus transportation, which required that African Americans sit at the back of busses. From that time on the list of non-violent protests that were led by Dr. King goes on and on including lunch counter sit-ins to do away with the practice of not allowing African Americans to eat in "white only" restaurants, and the famous peaceful march in Selma, Alabama, to gain voting rights for his people. For his work in bringing about changes in a peaceful manner. Dr. King was awarded the Nobel Prize for Peace, one of the greatest honors that can be given to a person. Many millions of people respected and loved Dr. King for his work, but there were others who feared and hated him. His home was bombed, as was his church. He was often threatened and beaten. None of this stopped him from doing the work he had to do, and, most of all, he never returned violence with violence. But one night, April 3, 1968, he had a premonition that his life might be taken. He said, "I've seen the promised land. I may not get there with you, but we as a people will get to the promised land." The very next day he was gunned down in Memphis, Tennessee, where he had gone to help African Americans earn the same amount of money as whites for doing the same work. 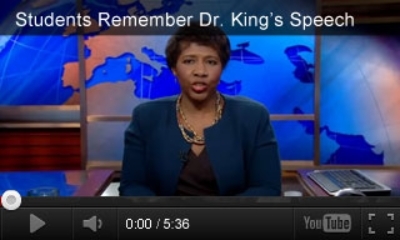 Return to Martin Luther King: Civil Rights Leader lesson plan.